When Judi Wunderlich was laid off from her managerial position at recruiting firm Aquent in early March, she spent little time looking for work on traditional job sites such as CareerBuilder, Craigslist, and Monster. Instead, she turned to social and business networking sites. "There's really no point in trying to apply for a job on a job board," says Wunderlich, who lives in Chicago. "There are so many other people who are hitting the job boards and sending résumés like crazy, and I know this because I was in recruiting." Wunderlich used her extensive network of contacts on Facebook, LinkedIn, Meetup, and Twitter to learn of new career opportunities. "I have not applied for a job or sent a résumé out. I've had all this activity and meetings, and it's all from the network," says Wunderlich, who was still on the job hunt as of late March. 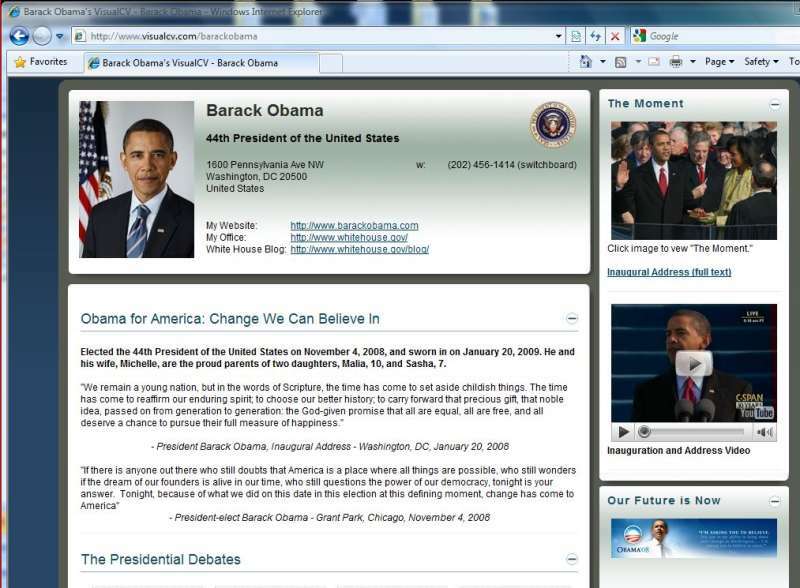 Here's what Barack Obama's resume looks like on VisualCV. A new collection of Web 2.0 tools, including social networks and online résumé builders that enliven your résumé with multimedia elements, are helping job seekers market themselves in a tough economy. Internet-based services can help you stand out from the crowd, and résumé-creation sites are a good place to start. Among them is VisualCV, a free service that lets you construct a résumé enhanced with audio and video clips, photos, slide shows, and charts. You can link your VisualCV résumé to other social media accounts, such as Facebook, LinkedIn, and Twitter. Similar, if less impressive, sites include GigTide, which charges extra for multimedia embedding, and Emurse, which offers a less-intuitive résumé builder. Are social networks a better way for job seekers to find work? For laid-off professionals, particularly those active in online communities, the answer may be yes. "By the time a listing has been posted on Monster, you're already behind," says LinkedIn spokesperson Kay Luo. "Generally, companies already have a couple of candidates they're interested in. And then you have to compete with the flood of résumés that comes in." How can job seekers use social networks effectively? The key is to be an effective networker before getting pink-slipped. "People can't wait until they lose their jobs to start networking," says Wunderlich. "Everybody should be doing it now." Be sure to connect your online profiles. Your Facebook profile, for instance, should link to your LinkedIn résumé, and vice versa. Next, notify your colleagues and friends that you're looking for work. If you're a Twitter user, tweet your professional (e.g., LinkedIn) profile to your followers. "That directs people back to a page where they can see everything you want them to know about you professionally," says Luo. If you do link your social and professional profiles, however, it's prudent to purge photos or comments that may raise a potential employer's eyebrow. Facebook users, for instance, may want to delete potentially offensive party pics or profanity-laced shout-outs from friends.